Mixer shaft exceed regular workload can make it move slowly. If the load is too big, it can make mixer shaft stall. If overload cause mixer shaft stalling, it needs adjust the charging rate, discharge redundant material and reduce the mixer shaft running load to make it normal running. Between pot wall and mixing blade or side blade having big foreign material can also make mixer shaft stalling. The reason of storing foreign material is the excessive gap between pot wall and mixing blade or side blade. When appearing this trouble, it needs stop concrete mixer immediately to check and worker gets rid of foreign material, and readjustment the gap between pot wall and mixing blade or side blade. If the electrical machine rubber belt is too loose, it will lead to transitive power short. Even smaller load also can lead to mixer shaft stalling. If rubber belt too loose leads to mixer shaft stalling, it needs stop machine and adjust the tension device to strain rubber belt. Mixing cylinder producing shrillness abnormal noise often is due to the foreign material between the blade or side scraper and pot wall, and pot wall fricative noise. 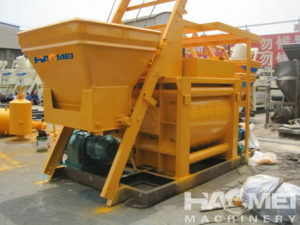 The foreign material will increase mixing friction to make mixer shaft running not well. This time, you should stop machine and take out the foreign material, then adjust the gap of blade, scraper and pot wall according to requirement. There are two severe reasons about the reducer internal noise, one is something inside the reducer and because of hitting or fierce rub to producing noise; the other one is bearing failure, due to rub aggravated in joint to producing noise during moving. In the process of blender working, once foreign material drops in the reducer, it will influence reducer regular work and big harm to reducer interior parts. Severe cases may result in damage to parts or scrap. When there is a foreign material in reducer, it needs stop machine to check, clear of foreign objects, repair or replace the damaged parts. If the concrete mixer bearing damages, its friction in the joint will increase, and bearing will be affected and make a big noise. In this time, the noise generated is often cyclical, because of the rotation of the bearings is uniform, when it goes to the damaged parts will produce noise, so the noise will have a certain frequency. If the bearing damage, it needs to replace with new bearings. Reducer temperature is high, usually due to increased bearing load, friction, caused a lot of heat. Its main cause is that the oil viscosity is too high or too low. Lubricating oil viscosity too high or too low both may make the reducer running load increase. Oil viscosity is too high, poor liquidity, running loads increase, will produce a large portion of calories so reducer temperature rise; on the contrary, low viscosity oil, lubricating effect of lowering it, increasing the friction of parts and components at run time, reducer works to overcome friction during running, and will also have a very large portion of calories so reducer temperature to rise. If this is the not appropriate viscosity of the oil, it should be replaced with suitable viscosity grade of oil. High temperature of agitator tank two shaft ends is generally due to the shaft end sharp friction. The reason of shaft end overheating is bearing damage or insufficient oil supply. Bearing damage of agitator tank is one cause of shaft end temperature too high. If mixer shaft is long-term work under high load, it will inevitably lead to bearing worn or damaged. Once the bearing is damaged, increased friction between axles and bearing, and will lead to the shaft end temperature is too high. Bearing failure of agitator tank needs to be replaced new bearings. Lubricating oil supply shortage is also the reason of shaft end temperature too high. Lubricating oil is not enough, the friction between axles and bearing is also exacerbated, in particular the concrete mixer used for a long time, and less maintenance, often leading to the above phenomena occur. To prevent agitator tank two shaft ends temperature is too high, should be timely maintenance to the concreter mixer, and add oil as the regulation. The primary cause of shaft end leakage is floating seal damaged. Concrete mixer shaft ends are stress concentrated parts, parts and components in the effect of high strength, their working life can be greatly reduced. Therefore, should be maintaining to shaft parts in a timely manner, and change the seals. If the shaft ends leakage, it shall be timely replacement of float seals.